Aaron Altherr headed to the batting cage around the fifth inning and took more than 100 swings of soft toss. "You never know when you need to be ready," he said with a smile. Altherr proved to be the hero on Sunday, cracking a pinch-hit game-tying three-run homer in the eighth inning and setting the table for Freddy Galvis to eventually drive home the game-winner in the 10th via a sacrifice-fly to center. The 6-5 win marked the third time the Phillies have won in walk-off fashion this year and snapped a five-game losing streak. 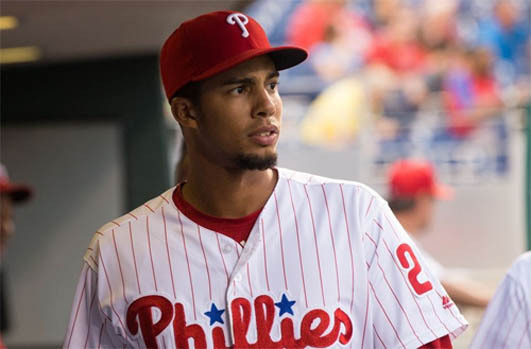 "[Altherr] has a high ceiling," said Phillies manager Pete Mackanin. "To me, it's always been the length of his swing. It was always a little bit contorted, but he's shortened it and now with the bat on his shoulder he take it from 'point A' to 'point C' while eliminating 'point B' and that's a good thing. He's direct to the ball and I think he's growing with confidence." Altherr swung at the first and deposited the Matt Albers slider into the seats in left center. "Whenever you can come through like that, it's just awesome," Altherr said. "Now we need to keep the momentum going." Jeremy Hellickson struggled for the second straight outing. He ran a high pitch count and gave up five hits, three walks and three runs while lasting just 4 2/3 innings. All three of the runs came on a pair of homers by Jayson Werth, a solo shot in the first and a two-run blow in the fifth. Jake Thompson pitched two innings in relief and gave up two runs. He walked three. "Big turnaround," Galvis said. "This is baseball, you know? This is baseball. Sometimes it goes wrong and sometimes it goes good. I think I'm just here to play hard and help the team win some games." Odubel Herrera had led off the frame with a double down the left field line against Blake Treinen. Altherr drew an intentional walk and pinch-hitter Vince Velasquez had a bunt single to load the bases. "I knew I just had to put the ball in the air with the one out and that's what I did," Galvis said. The Phillies have an off day on Monday before welcoming Carlos Ruiz and the Seattle Mariners to town for a quick two-game set.